Benefits enjoyed by RiggerTalk Members - Oilfield Services Marketing at its Best! Oilfield Services Marketing at its Best! 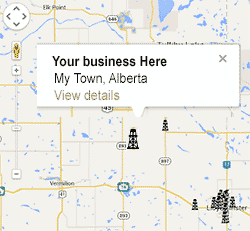 Riggertalk members can reach out to the customers they need and want by linking their business to the Oilfield Directory and Interactive Map. The Directory advertises company contact information and shows a geographical pin on the map. Riggertalk's unique Map is designed to search businesses by: Location, LSD, Categories/subcategories, Equipment Sales, and Jobs. Members will have exclusive access to posting Jobs and Equipment sales 24 hours a day. Ads are posted immediately and can be easily edited online. Riggertalk.com is the quickest and simplest site to locate Oilfield Services, equipment, and jobs from any desktop or mobile device. Become a Riggertalk member today and see how we can increase your business potential.